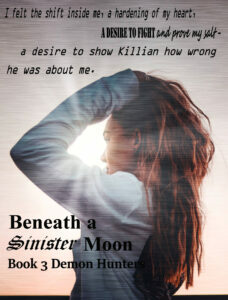 Demon Hunters Book 3 is LIVE and an Amazon GC Giveaway! 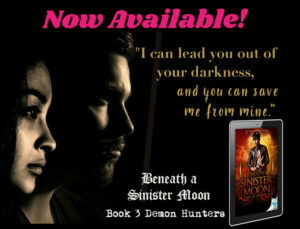 Beneath a Sinister Moon, Book 3 Demon Hunters…the wait is finally over. Get your copy today and dive into the epic conclusion. See why readers are calling this the best in the series! The premonition is clear. 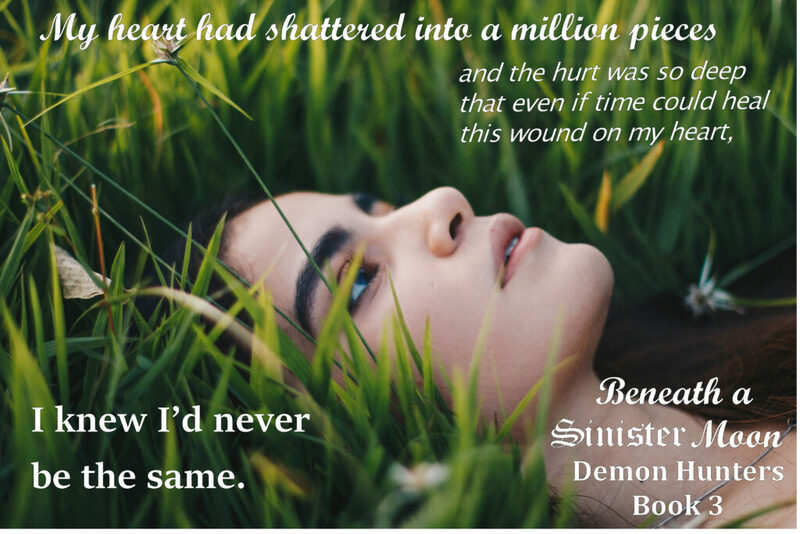 Demons are coming for Cassidy, and once her blood has been spilled humanity will be lost. Not only has Tyler been tasked with assassinating Cassidy, but killing her will be the last step he needs to take in order to become a full demon. Killian knows this and vows to keep Cassidy safe, but not everything is as it seems. Figuring out who to trust, who to confide in isn’t easy. With so much at stake one wrong move could mean the end of the human world, causing Cassidy and Killian to lose everything…even each other. With a war raging between two sides, Cassidy and Tyler find themselves at the heart of battle between good and evil. She wants to save Tyler. He wants to kill her. What will it take to restore the balance? And will Cassidy be strong enough to make the ultimate sacrifice if it means saving the world? 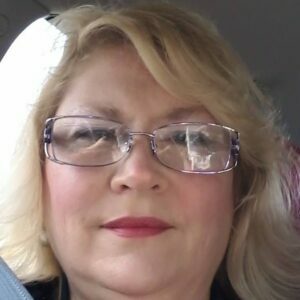 Posted on December 4, 2018 Author Deborah RoachCategories 5 star reviews, amazon, author, award winning author, Beneath a Sinister Moon, bestselling author, between the bleeding willows, bleeding willows, book, book lover, book reviews, book tour, Books, bookworms, casper, cassidy, characters, D.A. 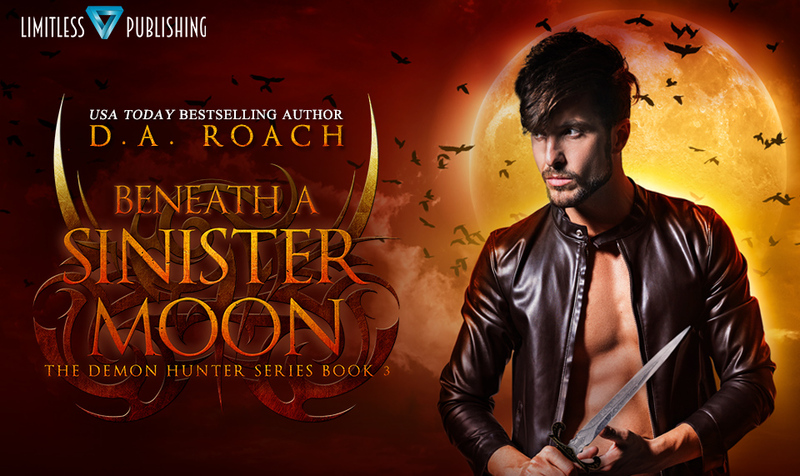 Roach, demon hunter series, demon hunters, Demons, ebook, fiction, giveaway, goodreads, Homer Glen, indie author, jace, killian, kindle, Limitless Publishing, must read, new book, new release, novel, paperback, paranormal, PNR, rafflecopter, reader, readers, reviews, Roach, series, tbr, teaser, teen, teen read, teen story, within the darkest hollows, ya, YA author, ya books, ya fiction, ya lover, ya paranormal, Young adultTags Beneath a Sinister Moon, Between the Bleeding Willows, book, book series, book teasers, DA Roach, Limitless Publishing, new book, new release, paranormal, paranormal book, Paranormal lover, paranormal series, within the darkest hollows, ya book, ya lover, YA Paranormal, ya paranormal series, young adult1 Comment on Demon Hunters Book 3 is LIVE and an Amazon GC Giveaway! 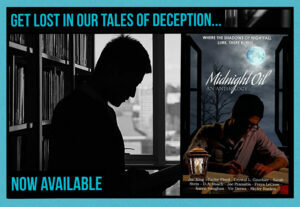 Here’s a collection of short tales of deception, including tales by USA Today Bestselling Author, D.A. Roach, author, Joe King, Joe Pranaitis, Karen Vaughan, Taylor Floyd, Author Sarah Stein, Crystal L Gauthier, Freya LeCrow, Skyler Rankin, and Viv Drewa. Posted on August 8, 2018 Author Deborah RoachCategories amazon, anthology, author, authors, book, Books, ebook, fiction, kindle, must read, new, new book, new release, novel, reader, readersTags amazon, cheating, deception anthology, deception lies, kindle, Midnight Oil Anthology, must read, new book, new release, new stories, short storiesLeave a comment on HERE IT IS! Q&A with Midnight Oil Anthology Author, Crystal Cauthier! I love working from home at my three business’, Laying in the sun, traveling, talking to friends and doing crafts. My life has been full of surprises and hard times. I have persevered to be a successful publisher, promoter, jewelry consultant. I’m a former Paralegal of 30 years+, An Author, Publisher, Promoter, Marketer, Wife and mother of 5 grown children and 15 grandchildren. I live in Louisville, KY. I call myself a researcher as I write Historical romance. I love to find out about, people, places and things. I am working on a few things, book 3 in my time travel series. Another Cookbook and a Horror Novel. The Haunting of Claire Pritchett is inspired by mental illness, horror and deception. It is something I came up with one night lying in bed. Researching Nero (37 AD – 68 AD) Bust of Nero © Nero was the fifth Roman emperor and the last of the Julio-Claudian dynasty. He is remembered as an ineffectual, neglectful and brutal leader. How do you stay in touch with your muse? Meditation is the key to that for me. On the verge of sleep in the REM state I usually have the vivid stories hit me. The fact that I taught myself how to edit and recognize that I love dialogue between characters that is in depth and fun to write.